Do have loose game cartridges and need a high quality case with color insert? High Quality reprint of the Video Game Box art. Universal Game cases are used with Super Nintendo, Sega Genesis, Master System, Atari, and N64 systems. 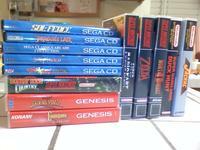 We use High Quality DVD cases for Sega Saturn,Sega CD, PS2, Gamecube, Playstation and Dreamcast. High Quality DS cases for Nintendo DS and Gameboy Advance. We also have Wii, PS3, and XBox replacement cases. And can print out the inserts for them as well.